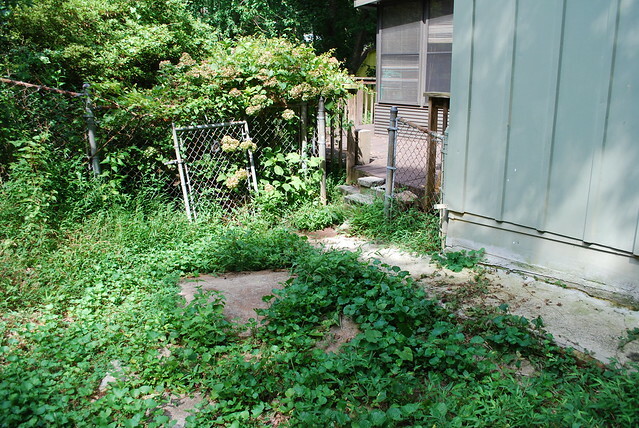 These pictures were taken after we trimmed the weeds down – they were easily higher than the deck railing when we got the keys to our house! 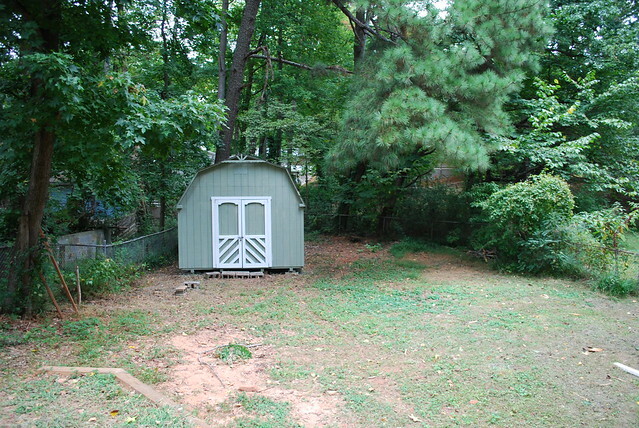 This shed was actually in good shape, but the color left something to be desired. Also, previous owners left a huge pile of branches that we later discovered also included a bunch of miscellaneous trash, including rusty paint cans and an old propane tank. There were a lot of problems with the sunroom and deck that had been added on to the back of the house. The room leaked and the deck went all the way to the fence, making the backyard seem very small. So, we hired someone to take it all down. 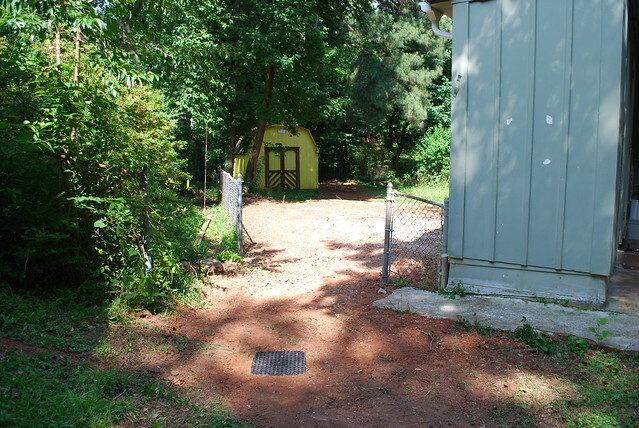 We also removed part of the chainlink fence, as it did not follow the property line. After doing this, our backyard looked very trashy. 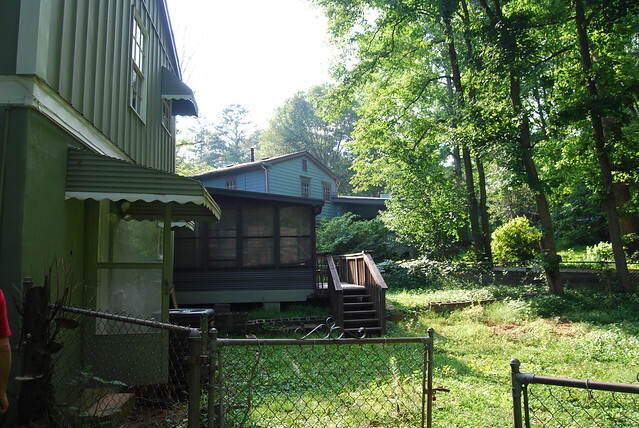 Also, the porch had apparently been added before the house was painted, so once we removed it, a portion of the back of our house was the original yellow. We had plans for the yard, though! 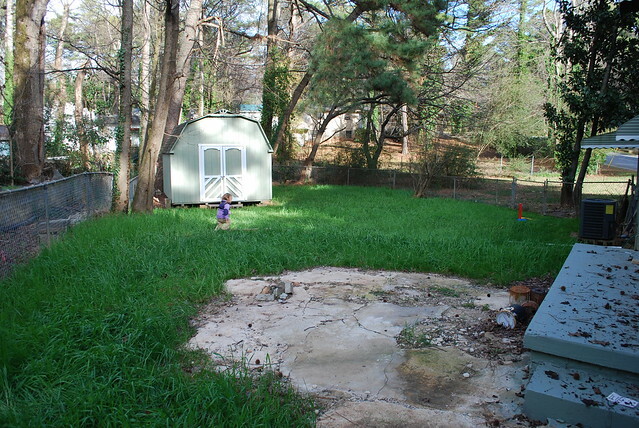 First off, we needed to take care of a problem of the water drainage in the backyard – the storm water from the neighborhood was coming into our yard and pooling around the foundation of our house, causing it to crack and sink. 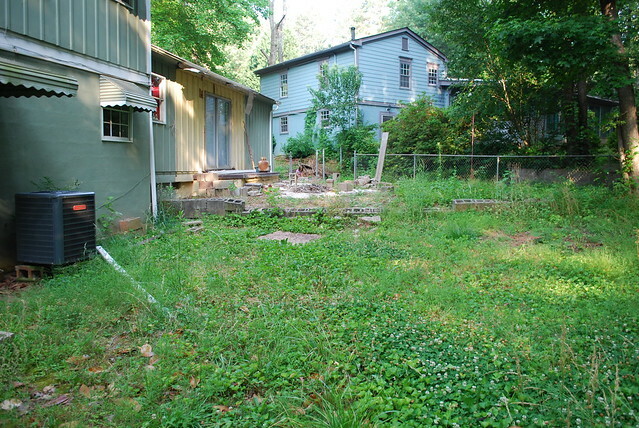 We hired a landscaper to come in and grade the backyard, put in a retaining wall, and bury pipes to divert the water. 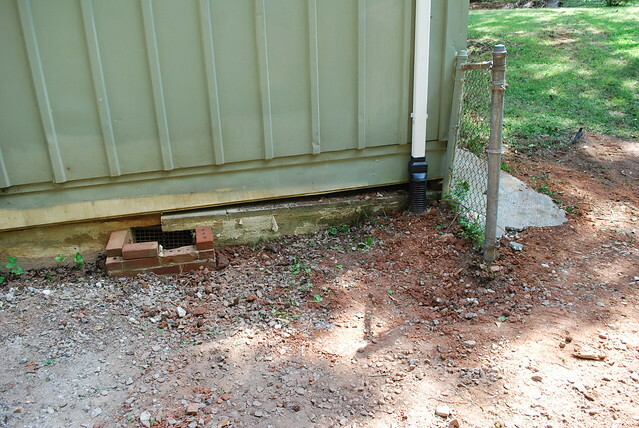 They put in a catch basin at the entrance to our backyard, and also buried the downspouts in three places. They came back a few months later and planted grass. We were very pleased with how the retaining wall turned out, and the underground piping has made an enormous difference. Our yard used to flood with every rainfall, and now it just gets soggy when we have an especially torrential downpour. Below is a picture of the catch basin. These steps were important for preventing the foundation from getting worse, but unfortunately the damage was already done. 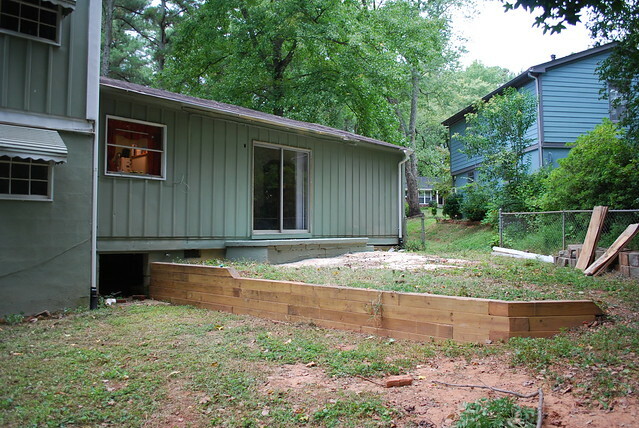 Here is a picture of what we discovered when we removed the sunroom and deck. If we had known about this before, we would not have bought the house. After about a year of having a partially yellow house, we finally were able to find the correct color paint and set aside a few days to clean the siding and the shed with a pressure washer, and then paint it to match the rest of the house. 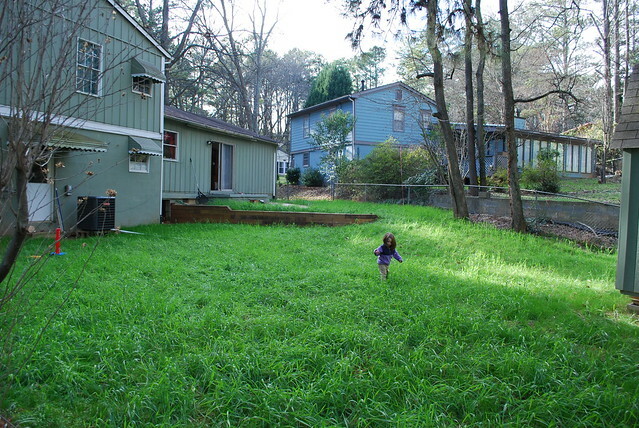 A few months later, when the weather cooled off, the landscaper came back, graded the yard, killed all the weeds, and planted grass seed. We watered it diligently and were rewarded with beautiful, lush grass. The one thing left over from where the porch was is a cement pad. 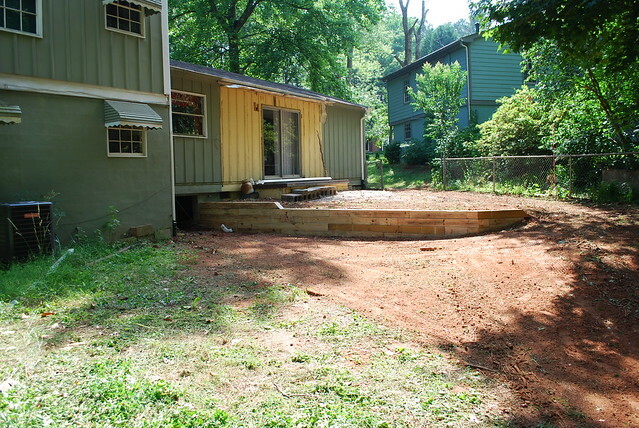 We are hoping to turn that area into a patio someday. 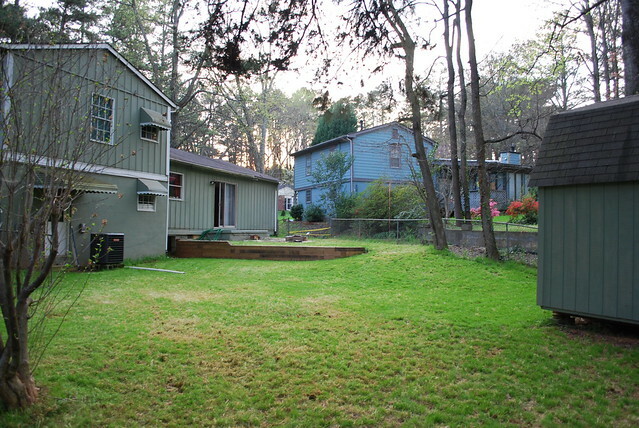 We were sad to mow the grass, but it still looked great afterward. We love the shed being the same color as the house – we think it really helps the whole backyard tie together with the house. These pictures are slightly misleading because although they are the most recent ones we’ve taken of our yard, the grass does not look that full and lush anymore. An extremely wet summer this past year has caused the weeds to spring back up, and since we don’t really know what we’re doing (and avoid using chemicals when we don’t know exactly what *they* are doing), they have overtaken the grass at this point. When we keep it cut short, you almost can’t tell. Took down the sun room and deck. 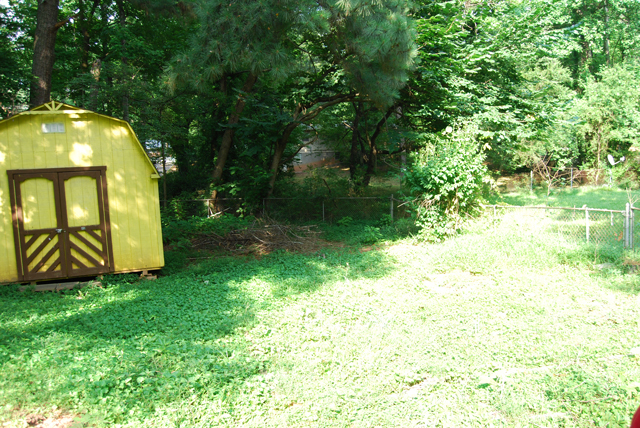 Removed part of the chain link fence to reclaim that section of our yard. Installed a catch basin for water and buried underground pipes to divert water from our yard into the creek bed at the edge of our property. Removed the cinder blocks and built a retaining wall. 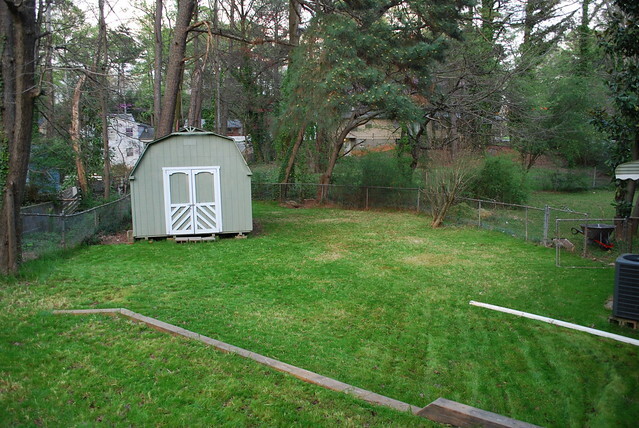 Painted the back of the house and the shed to match the rest of the house (green with white trim). 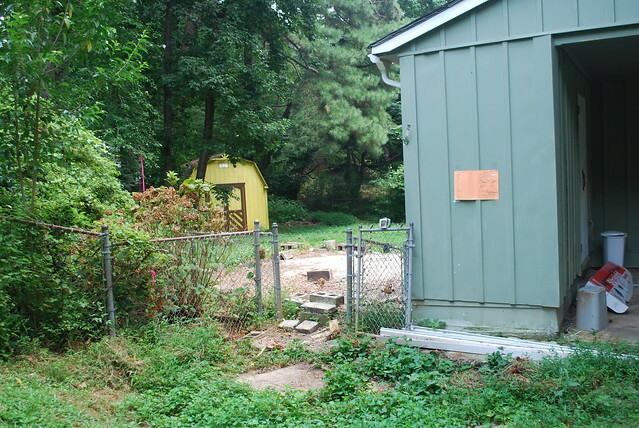 You can read all the back yard posts here.